Catharine Sudler Ball was born in June 1872 in Bridgeville, Sussex County, Delaware. Alexander Ball and Laura Sudler appeared in the US federal census of 1 June 1880 in Northwest Fork Hundred, Sussex County, Delaware, and a female domestic servant and a young male store clerk.. Other members of the household included Catharine Sudler Ball, Charles S. Ball. 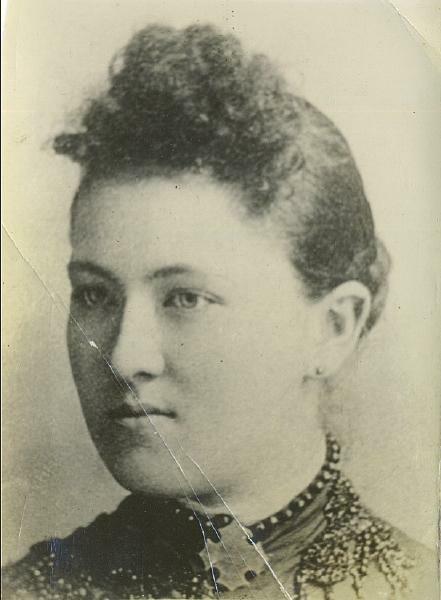 At about age 14, a professional photograph was made of Kate Ball by Waite, Sixth Avenue, corner of 18th Street, N.Y.
She married Frank E. Lockman on 8 July 1895 in Newark, Essex County, New Jersey, and it is not yet known how the marriage ended. She married Adolph Dexheimer, son of Louis Peter Dexheimer and Julia Penner, on 23 August 1898 in Manhattan, New York, with Christian Buckisch, Pastor of St. Paul's Evangelical Church, officiating. Witnesses were Kate Longfellow and August T. Schroeder. In August 1898, Catharine Sudler Ball was living in New York City, New York, at 129 East 127th Street according to her marriage record. Catharine Sudler Ball appeared in the US federal census of 1 June 1900 in Manhattan, New York, at 129 East 127th Street boarding in the household of William and Katharyn Longfellow (the street address given at the time of her 1898 marriage). Kate Longfellow was a witness to the marriage of Kate and Adolph, and Adolph has yet to be found in 1900.. Other members of the household included Catharine F. Dexheimer. Adolph Dexheimer and Catharine Sudler Ball appeared in the US federal census of 15 April 1910 in Manhattan, New York, at 231 East 126th Street and three lodgers.. Other members of the household included Catharine F. Dexheimer, Laura S. Dexheimer, Lillian Margaret Dexheimer, Katharine Frances Manning, Margaret Ann Manning and Grace Cecilia Manning. She married Ernest D. Fuhrman say 1918. Ernest D. Fuhrman and Catharine Sudler Ball appeared in the US federal census of 1 January 1920 in Rockland, Sullivan County, New York, at River Street. Other members of the household included Lillian Margaret Dexheimer, Alfred J. Fuhrman, Mary V. Dexheimer, Joseph A. Fuhrman and Harry A. Fuhrman. She married William J. Lee say 1928. Catharine Sudler Ball appeared in the 1930 Norwalk, Connecticut, City Directory at 21 Marshall with William J. Lee..
William J. Lee and Catharine Sudler Ball appeared in the US federal census of 1 April 1930 in Norwalk, Fairfield County, Connecticut, at 21 Marshall Street and grandson William Frundenthal, age 15.. Other members of the household included Catharine F. Dexheimer, Daniel J. Moran and Alfred J. Fuhrman. Catharine Sudler Ball appeared in the 1941 Norwalk, Connecticut, City Directory at 21 Marshall with William J. Lee..
Catharine Sudler Ball died on 19 May 1945 at age 72 in Norwalk, Fairfield County, Connecticut. William J. Lee became a widower at her death. She was interred at Riverside Cemetery, Norwalk, Fairfield County, Connecticut. The following appeared in a local newspaper: Mrs. Catherine Ball Lee died May 19, 1945 in Norwalk Hospital after long illness. She is survived by her husband William J. Lee, daughters, Mrs. Herbert V. Kingwell, Mrs. Andrew Stabell and Mrs. John F. Olivieri all of Norwalk. Mrs. Charles E. Main of Ridgewood, NJ, one brother, Charles Ball, Spring Lake, NJ; and 9 grandchildren. Services from Raymond Funeral Home and interment Riverside Cemetery, Norwalk, CT. It is likely that this photograph, identified only as "Dexheimer" on the back, is one of Adolph & Kate Ball Dexheimer's girls.